His line "You stink, loser!" was supposed to be much longer, having him saying "You stink, dude, even my grandmother could get past the first gorilla, and she thought this was a cigarette machine". In the homage to "Space Pilot 3000" in "Law and Oracle", his role is fulfilled by Zoidberg. 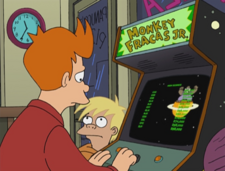 Fry: And that's how you play the game. 20th-century kid: You stink, loser! 20th-century kid: Yo, there's dog fur on my slice. This page was last edited on 7 September 2014, at 20:14.